We drive out of the centre of Lisbon over the 11 km long Vasco de Gama bridge, crossing the Tejo esturary, and head for the Alentejo. 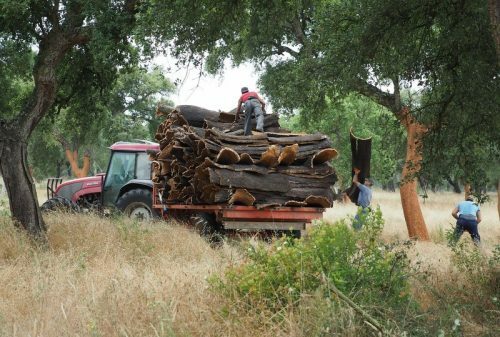 We are off to the cork forests, to witness the harvest of cork bark. 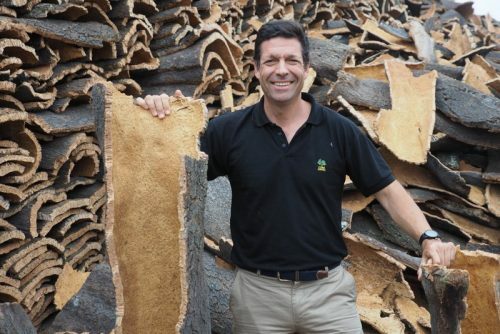 We were with Cork Supply’s Frederico Lima Mayer, who is in charge of buying cork from the various forest owners. 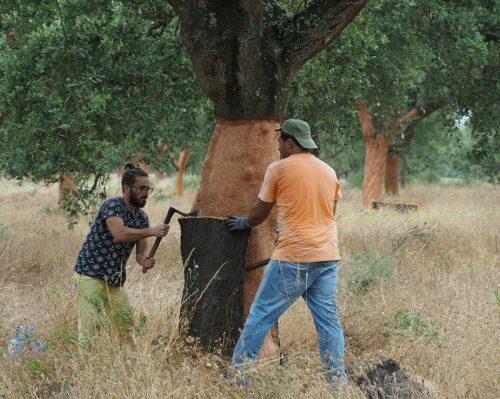 Quercus suber is the cork oak, and the biggest concentration of these forests is found in the south-centre of Portugal and then crossing over the border into the south of Spain. 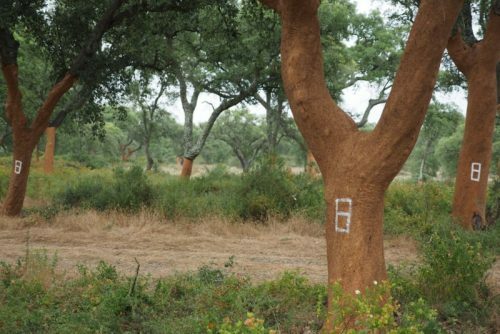 Cork forests aren’t dense, and the trees never grow very tall: they are well adapted to the long, dry summers these regions experience. 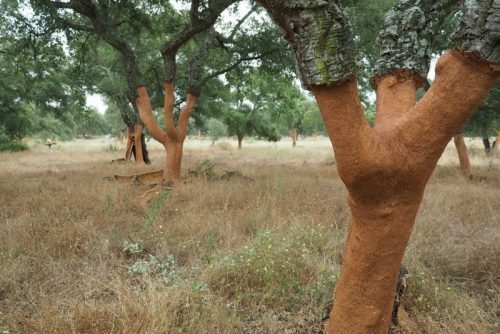 A cork tree is first harvested once the trees are mature, which takes around 25 years. 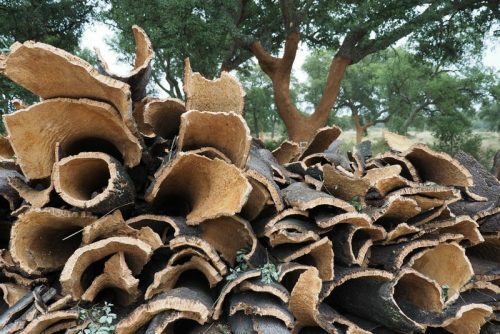 Then they are harvested every 9 years, which is how long it takes for the bark to grow thick enough for it to be useful for making corks. Not all trees are equal, though. 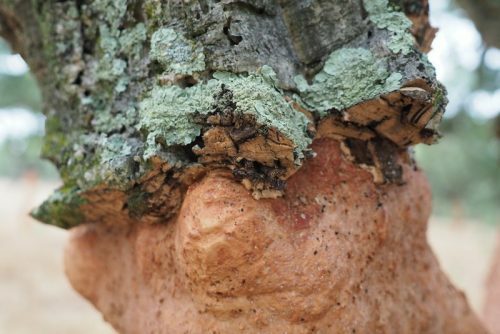 Some have beautiful bark that is good for making high quality wine corks. 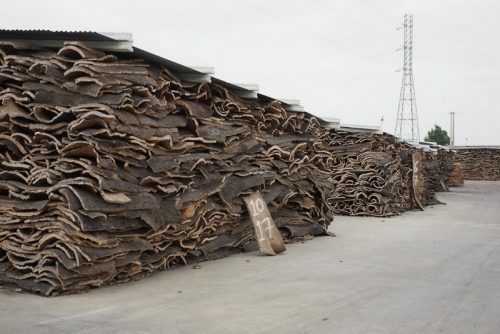 These can sell for 50 or 60 cents a piece (the very, very best corks can cost a Euro or even more a piece), and if, for example, you can get 30 kg of cork bark from a tree, and this could produce about 700 corks, then given that 30 kg of cork would cost around 80 Euros, the economics stack up. But if the cork is not of punchable quality, then it ends up being used for lower margin products. 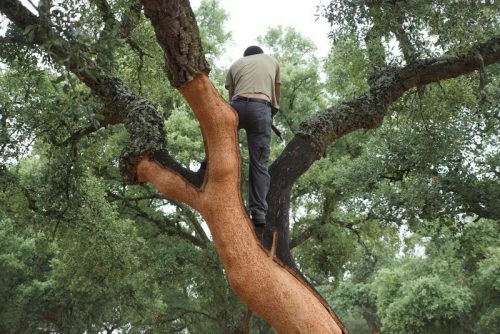 Harvesting the cork is a skilled job. The strippers are paid well, and the job is typically passed down along a family line. 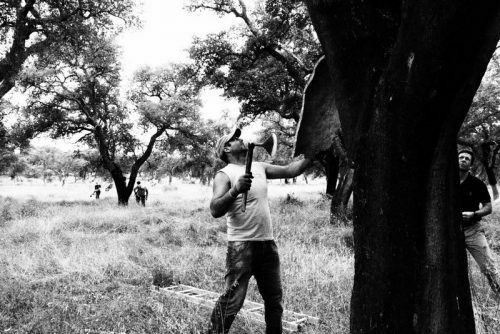 They have just one tool: an axe with a slightly curved blade. 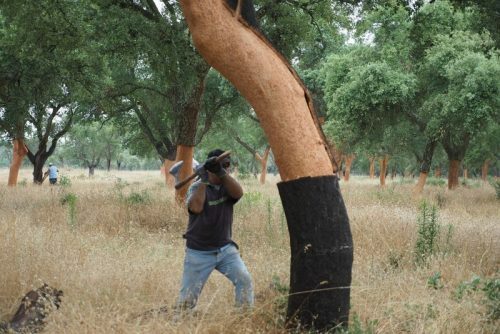 They have to make cuts along a line, and then use the head of the axe to prise the bark off without splitting or damaging it. They work in teams of two, and make the job look quite easy. We spent quite a bit of time just watching. 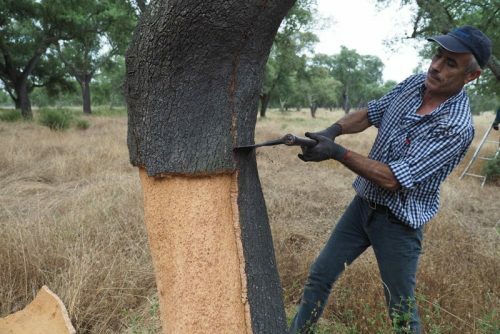 The harvested cork is then left beside the tree and picked up the next day. After harvesting, a single digit is painted onto the tree: the last digit of the year of harvest. 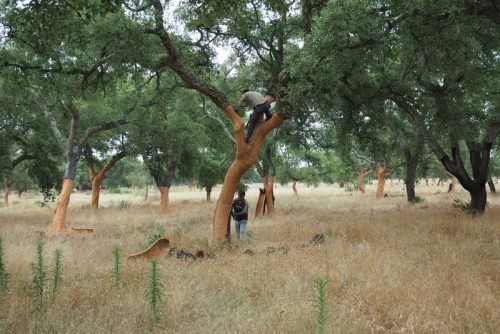 So these trees will be painted with an 8, indicating that the next harvest, 9 years later, will be in 2027. 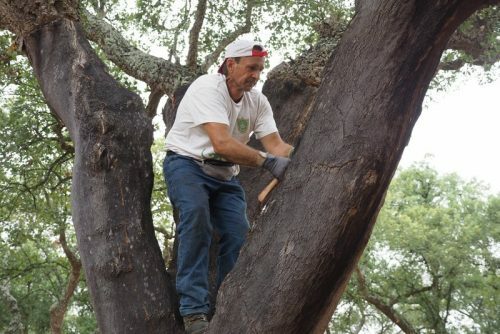 Cork oaks are unusual: if you strip the bark of most trees, they will die. 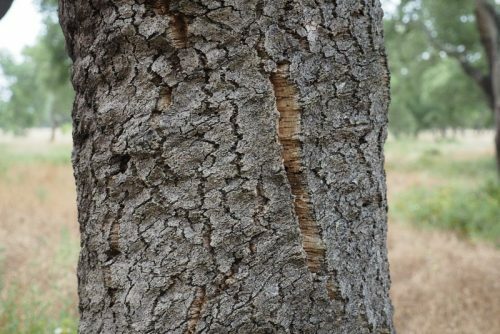 This is because the cambium layer, which is what creates the new vascular tissue, is stripped as well. 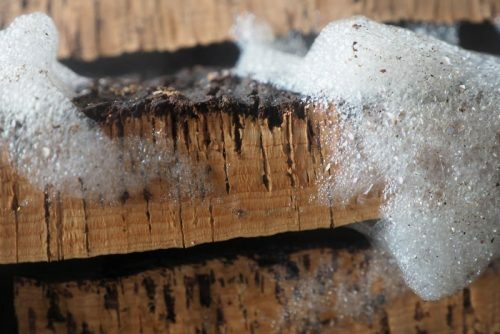 While water flows up the xylem vessels in the trunk, the sugars from photosynthesis are transported by the phloem, and this is removed with the cambium causing the tree to die. 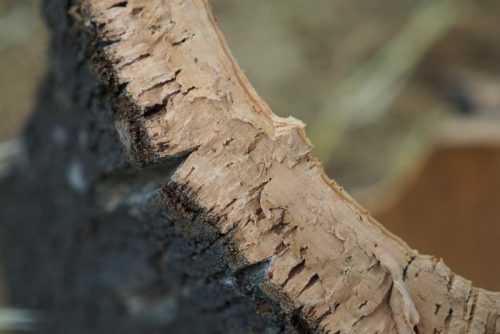 Cork bark can be removed without damaging the cambial layer, and keeping the phloem in place. 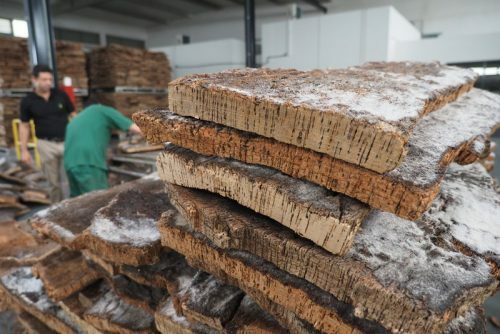 The cork is collected and loaded onto trucks, and then reloaded onto larger trucks to take them to the processing plant. 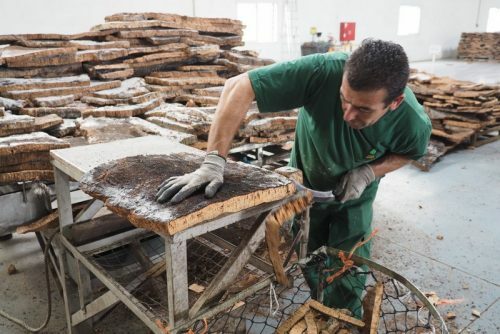 Most cork companies have a processing plant in the south, near the forests, where they prepare the cork planks, stack them on a pallet, and then send them up to the cork factories in the north, near Porto. The cork arrives and is unloaded. 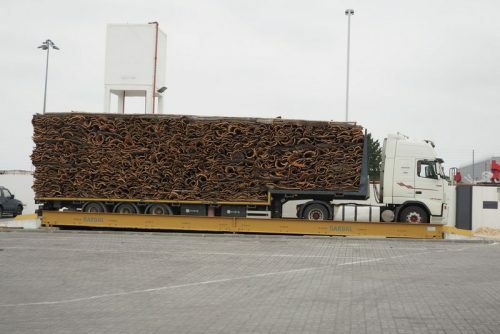 We witnessed a large lorry unload its cargo of cork planks, which had been carefully stacked on the back. It basically lets the whole stack, which is a few metres high, slide off the back onto the ground, so it doesn’t need to be re-stacked. Then a team goes through the piles and sorts them by grade. 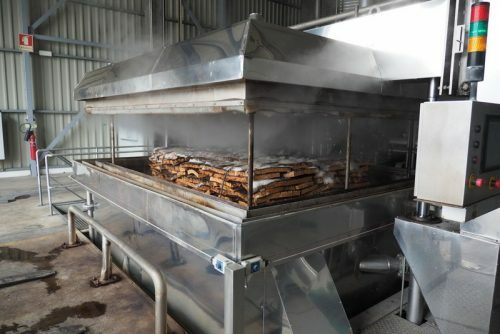 One mound is suitable for punching corks from; one is thinner bark that will be used to make granules, and one pile is rejected, and ends up being used for other purposes. 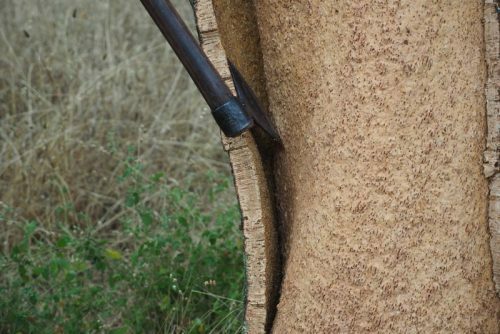 The cork bark is then stacked and is left outside to weather for a minimum of six months. The next stage in the journey of cork is boiling. 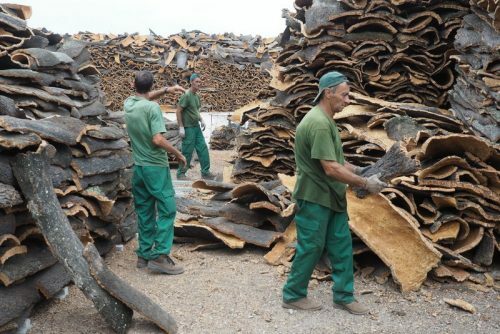 The seasoned cork planks are boiled to soften them, to clean them, and also to expand them slightly. In the past this was a problematic stage: the water was rarely changed so it was like all the members of a family sharing the same bath. 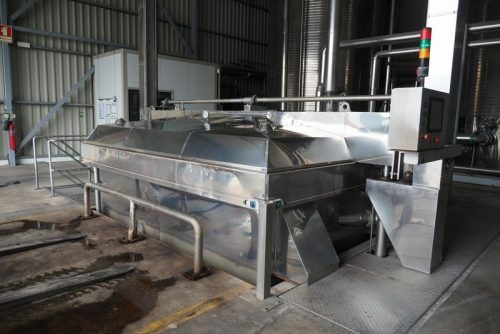 Now the water is filtered, and also replenished (around 40% is fresh during the day), so it’s more like a shower than a shared bath. 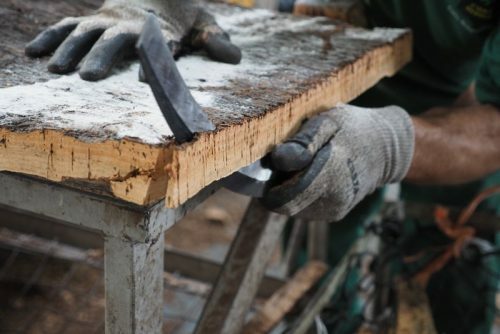 Finally, the boiled planks are inspected and cut into smaller pieces, with any major impurities being removed. This is also a final sorting stage. 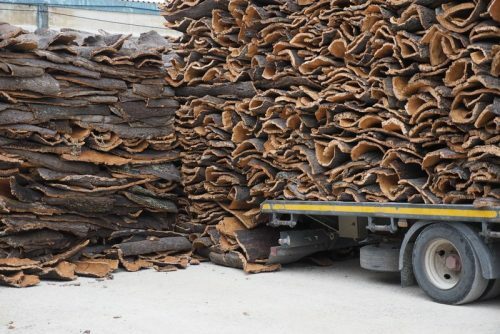 The pieces suitable for punching corks are then bundled back on pallets and sent up to the north to the cork factory.